Danone decided to run ads on Instagram Stories exclusively. Over a 6-week period, the brand ran two different ads in Stories. Activia wanted to encourage consumption of its product as a healthier choice for its audience at snack moments during the day. Owned by Danone, Activia is a natural food containing two enzymes (Streptococcus thermophilus and Lactobacillus bulgaricus) also present in normal yoghurt, plus a third ferment, Bifidus Actiregularis, which arrives alive and vital in the intestine. The choice to use ads in Instagram Stories for the Activia brand was a winning choice. Thanks to the campaign, Activia has reached and engaged not only the core target of the brand, but has obtained an important result in terms of intent to buy and reaching the millennial target audience, which is the most difficult to reach. Thinking about its target audience, Danone decided to run ads on Instagram Stories exclusively. 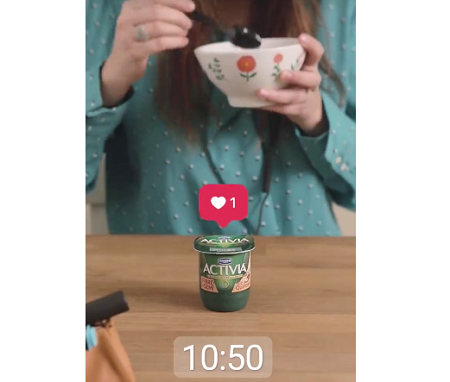 Over a 6-week period, the brand ran two different ads in Stories showing young women easily reaching for Activia as they go about their daily lives. Key brand metrics were also measured during the campaign run including ad recall and purchase intent. After the campaign ended, Activia saw a 22-point lift in ad recall, a 4-point lift in intent to buy Activia among 18-to 24-year-olds, and a 6-point lift to buy Activia among women aged 25–34. The global haircare brand used video ads on Instagram and Facebook across 5 key markets, lifting US sales by 8% and reaching over 60% of its target audience of millennials worldwide.